According to a recent report from the New York Times, Snap, the creator of the Snapchat app and Snap Spectacles may be developing a drone. 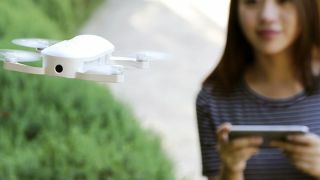 Three anonymous sources who claim to have been briefed on the hardware told the New York Times that the drone would be used to take photographs and record video to feed visual data back to the company. What’s not clear is whether a Snap drone would ever be made available to the public. By changing its name from Snapchat to Snap, the company made clear its intention to broaden its brand into camera technology rather than just social media. The release of Snap Spectacles was the company’s first foray into hardware so reports of a drone being in development is a good indication that more products are being planned. Even if it isn’t released to the public, Snap’s drone experiment could very well be re-purposed and rolled into another project in the future. Judging from this, it’s almost a certainty that Snap Spectacles won’t be the last product we see from Snap.